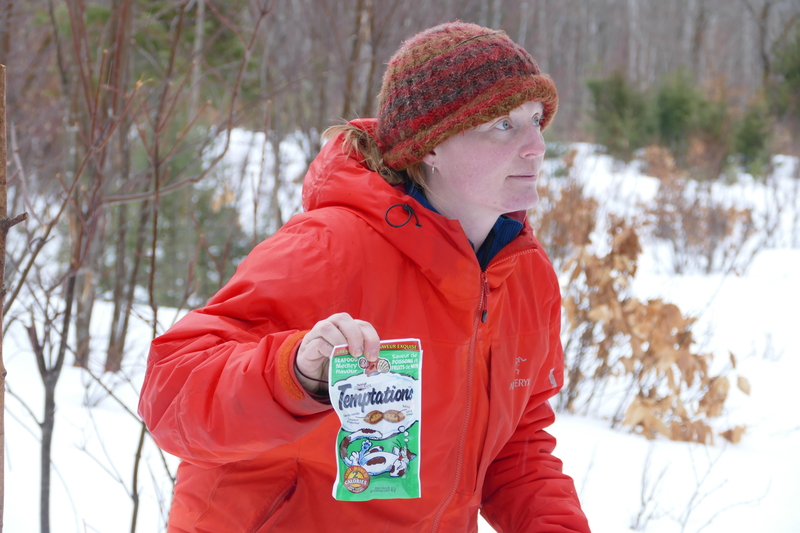 Sharing tracks and trails with naturalists in Guelph and the surrounding area. Still dark in the early hours of a mid-February morning, the lynx awoke and left the sheltered lee of the granite boulder where he had waited for the wintery northwest wind to abate. The rock shelter was a favorite place and he had used this place many times before. Like a forest ninja, the lynx moved stealthily through the dense cover of spruce and cedar trees, winding his way downhill towards the river. Occasionally, he took short detours to explore the well-worn hare trails, looking for breakfast. 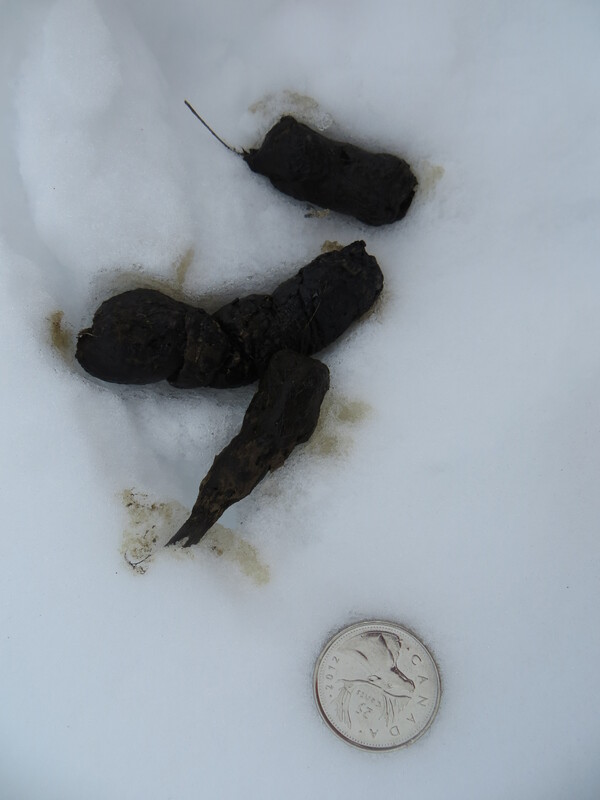 Having had no luck hunting on the upper slopes of the forest, he headed down into a snow-covered wetland which was covered with the tracks of busy weasels. A small creek was no barrier to his explorations and he leapt over it with ease. 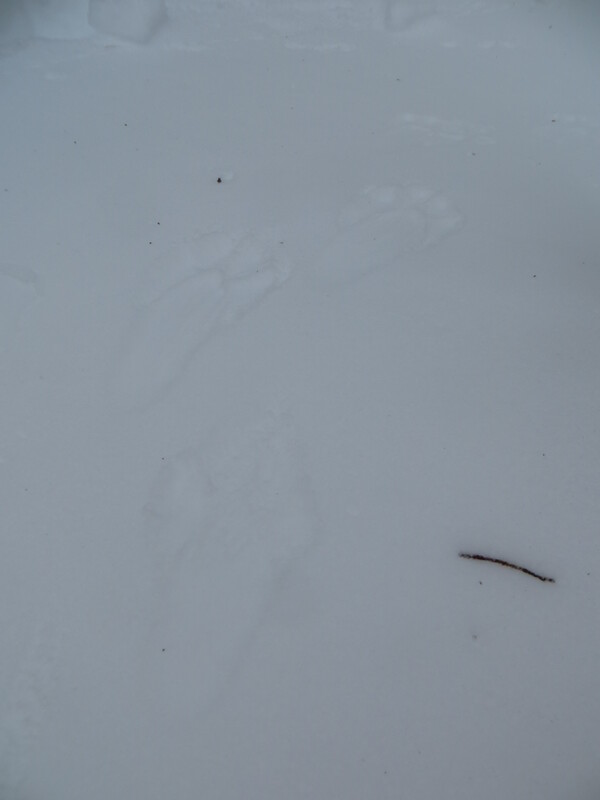 Eventually his wanderings brought him to the steep snowbank that marked the edge of a logging road. 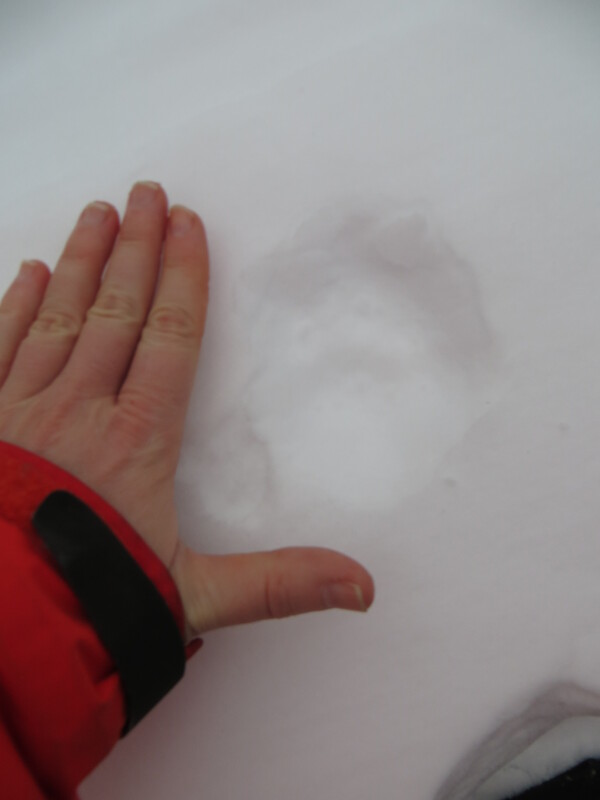 Carefully, he walked across the logging road and up the steep snow bank on the other side. 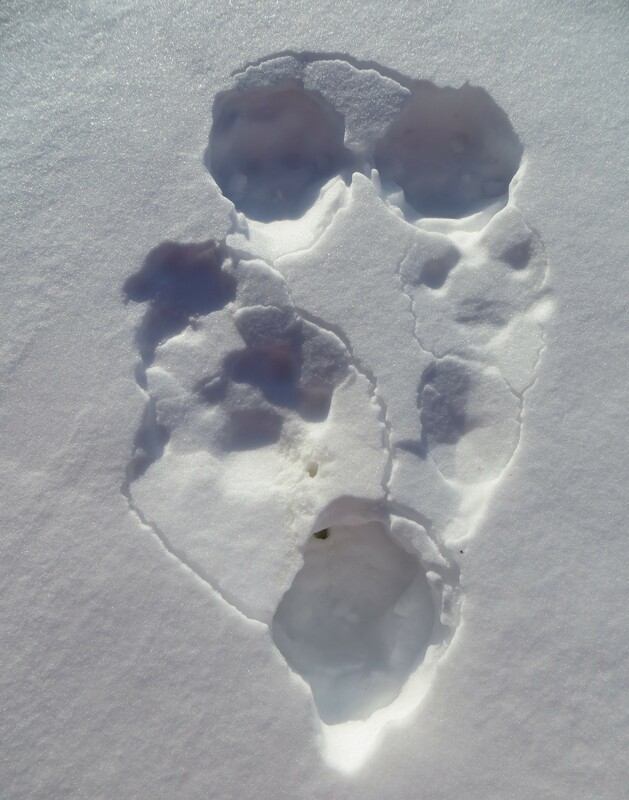 His toes splayed outward as he moved on the soft, fluffy snow, leaving a zigzagging trail of tracks behind him. He ducked under the boughs of the tight conifer trees, shedding a few dark guard hairs on the meandering trail. 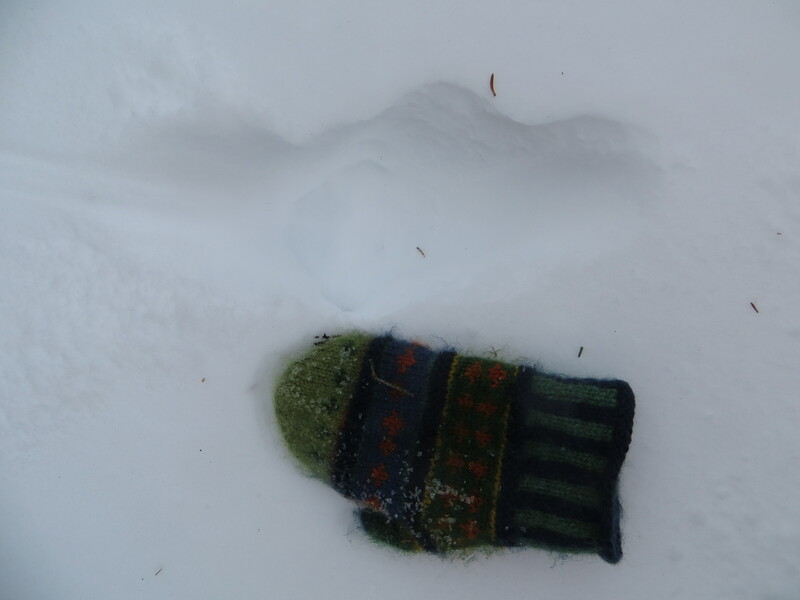 His acute sense of hearing and sight wakened as he smelled fresh snowshoe hare trails underfoot. The ground began to slope downward and his pace quickened. 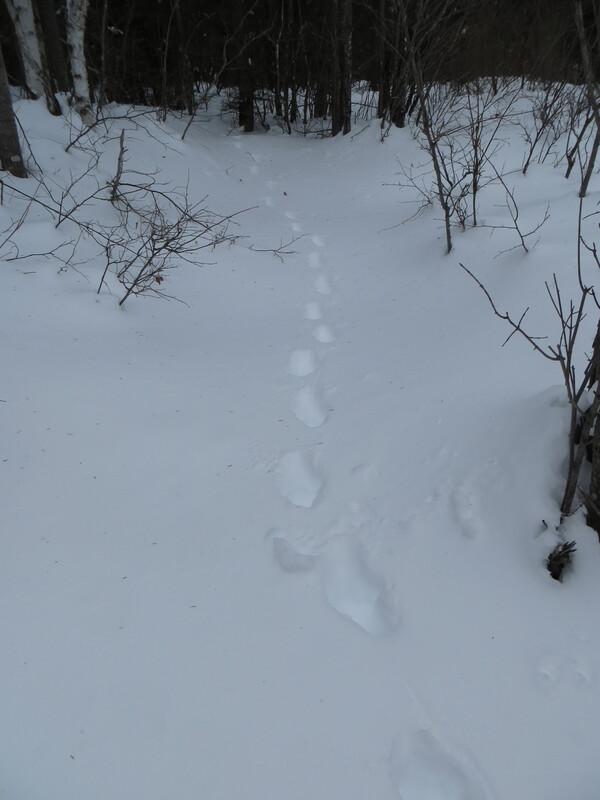 A snowshoe hare was foraging on a well-worn hare run at the base of the hill. He could see it! 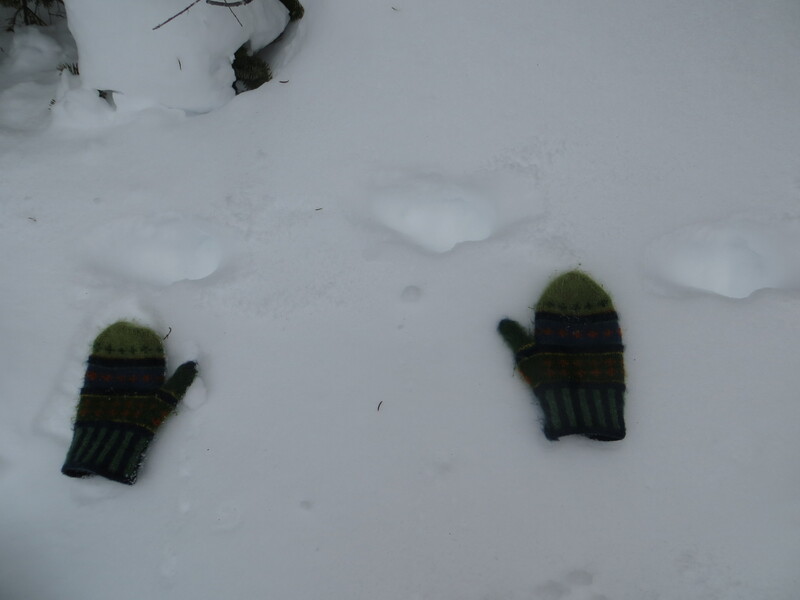 The lynx was invisible to the hare below. There was no wind to give away his scent and his heavily furred paws moved silently on the snowy surface. With lightning speed, he burst into a bounding gait, leaping and sliding down the steep slope. When the hare sensed what was happening, it was too late. 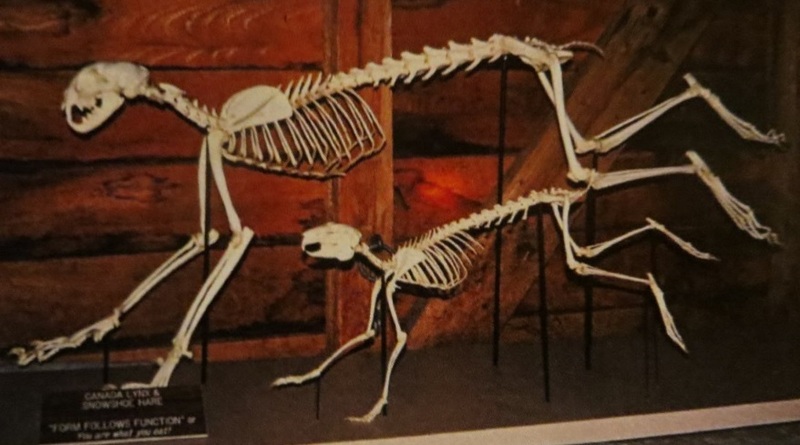 The bounding cat reached forward with his long front paw and grasped the hindquarters of the hare with razor-sharp claws. Snow sprayed into his face as his long canines bit into the head of the hare, killing it instantly. He sheared the back of the rabbit to open up the carcass and began to eat, starting with the meaty hindquarters. He made sure to eat the liver, lungs, adrenal glands and kidneys next. These organs provided him with essential Vitamin A which he was unable to get otherwise. The lynx used his rasp-like tongue to remove the meat clinging to the bones between the hare’s toes. All that was left after his meal was the hare’s intestines, a little blood, a rear foot and some toes. 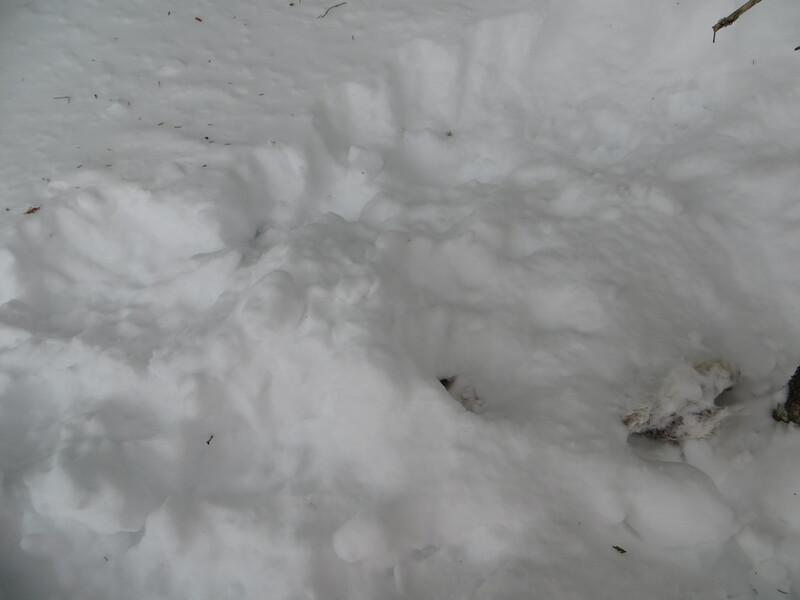 The lynx carefully used his front paws to gather snow to cover up the cache of remains. He left the sheared flap of skin from the back of the hare beside the cache. Depending on how successful his hunting would be in the next 48 hours, he might return to this cache to finish off the remains if he became desperate for food. The lynx looked up at the open, cedar swamp in front of him. 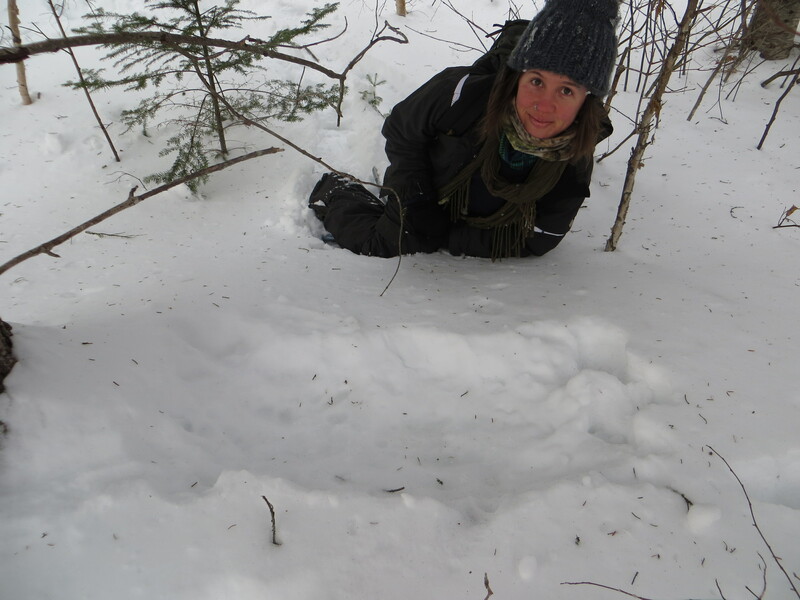 With a full belly, he walked northwest across the flat terrain and found shelter under a large spruce tree about 100 metres away from the cache. He curled up in the snow and made a large oval, resting bed. As the sun began to rise at 6:40am, he faced the eastern sky in a sphinx-like position. His belly, throat and chin were buffy white. His throat fur flared out to the sides of his cheeks, forming a ruff that was outlined in short, black stripes. 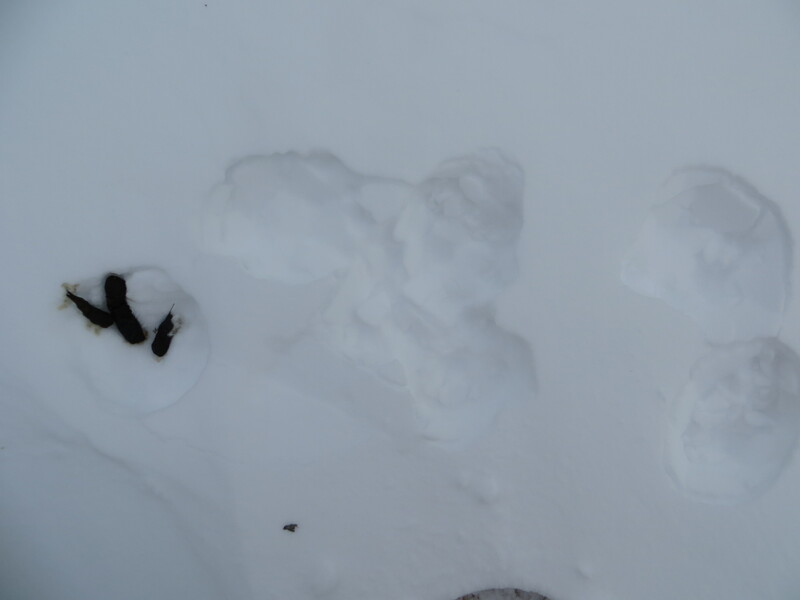 The heat from his body melted the snow, forming a hard-packed icy layer with impressions of his four legs beneath him. When the lynx was ready to move again, he stretched and then exited the resting bed. 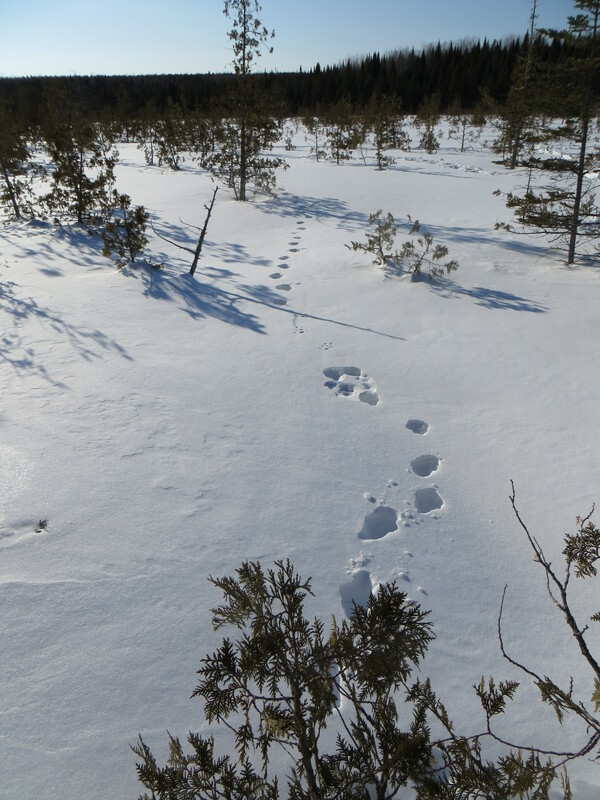 As he moved slowly out into the open cedar swamp, he paused to check his route before heading southeast. He meandered slowly across the swamp as the sun continued to brighten the sky. 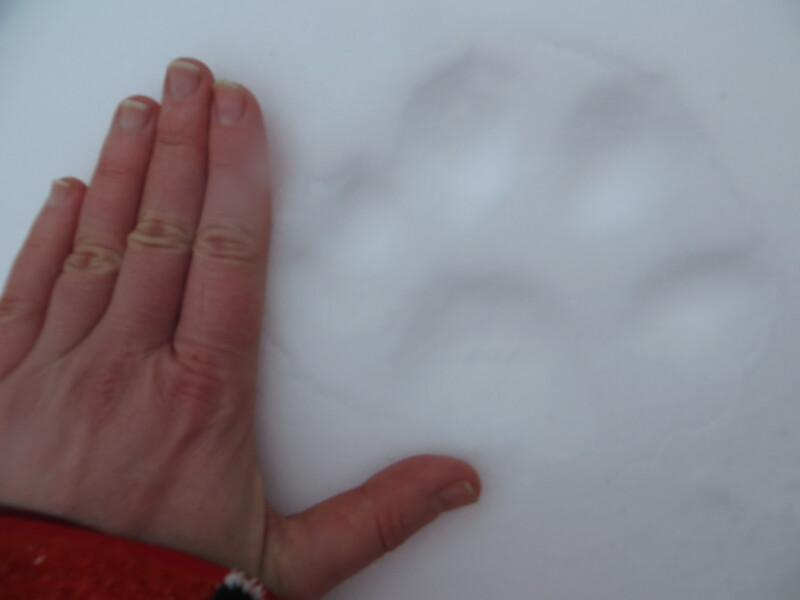 His two outside toes splayed to keep him on top of the snowy surface, leaving a trail of cross-like tracks as his long-toed, hind tracks registered directly on top of his front tracks. 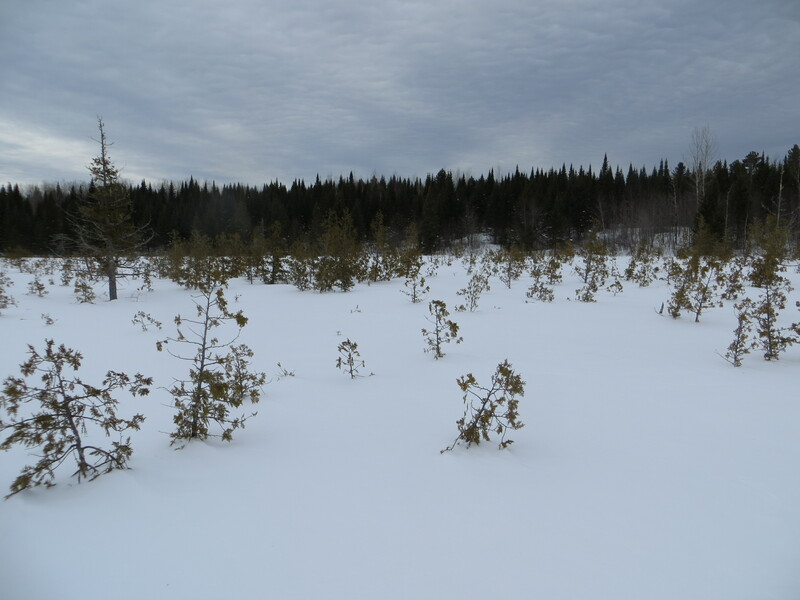 He wandered though some conifer trees at the south end of the cedar swamp, looking for more hunting opportunities. 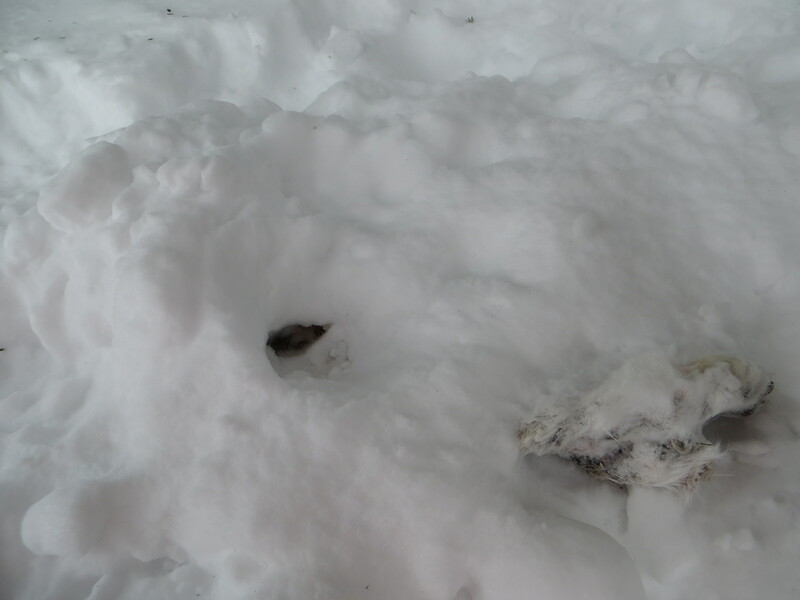 A deer mouse bounded across the snowy surface and found cover as a short-tailed weasel emerged from the trees. 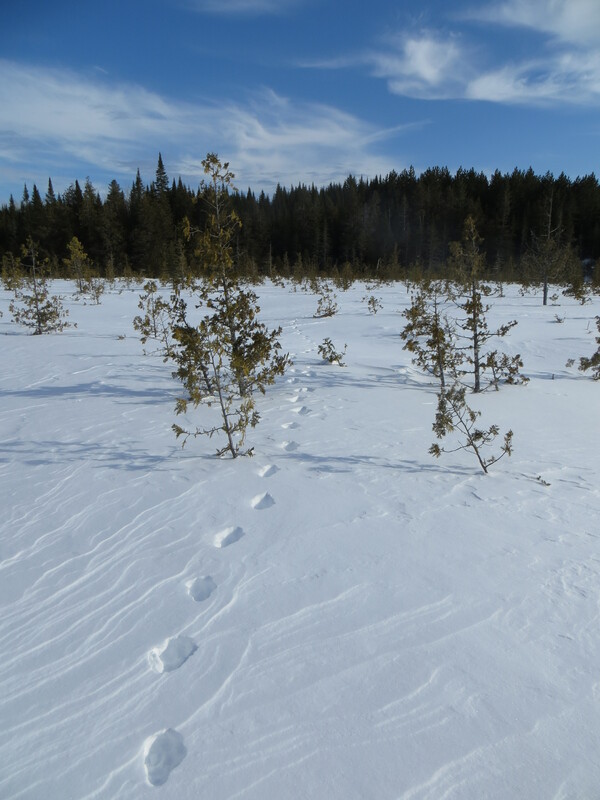 The lynx headed west along the edge of the cedar swamp. He paused to lift his black-tipped tail and spray urine backwards behind him. A few metres further, he stopped to produce a couple of darkened scats with tapered ends. 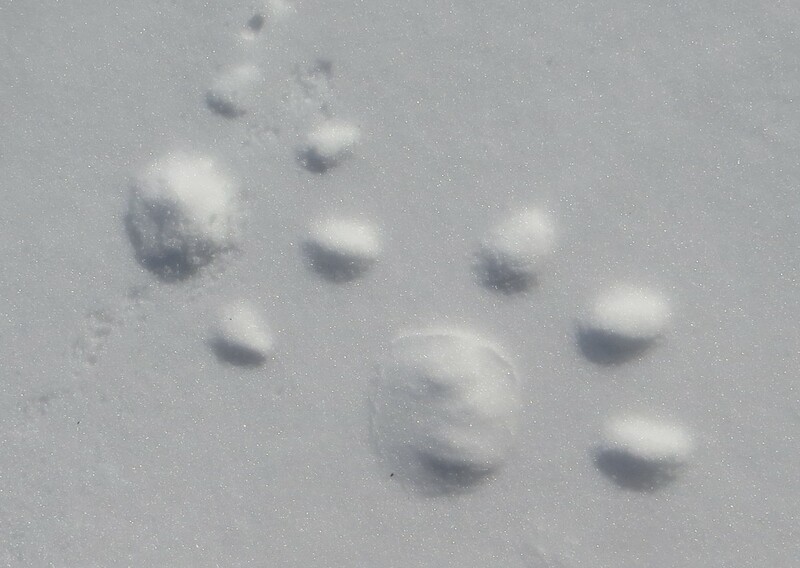 The lynx left these marks uncovered on the landscape. In another couple of weeks, breeding season would be at its peak. If another male lynx were to come here, he would know whose territory it was. 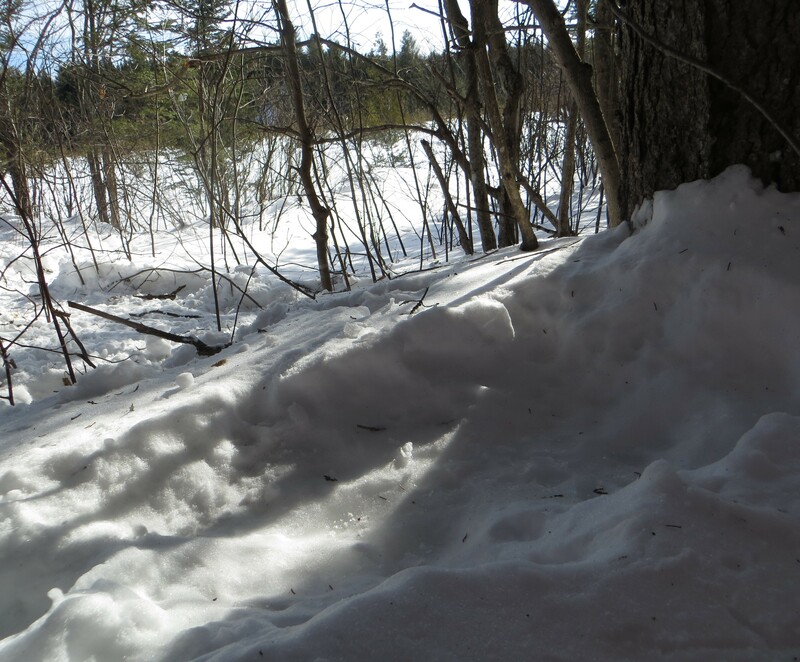 As he circled back to the cache site, he crouched down momentarily, facing the direction of the cache. Long tufts of black hair projected from his ear tips and a white rim of fur surrounded his large yellow eyes. 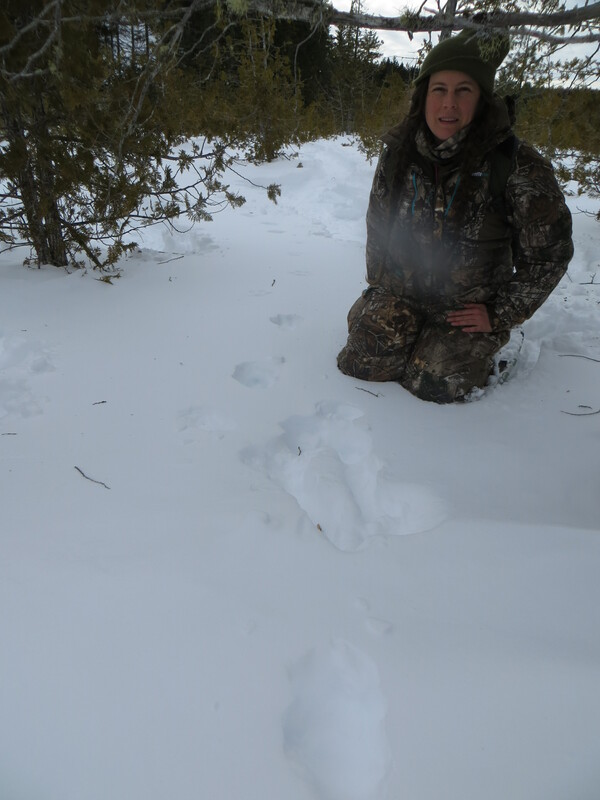 The lynx was frozen for a few minutes except for a few excited, short flicks of his tail as he remembered the success of his previous hunt. If there was another hare on the well-worn hare highway, he would need to get within 6.5 metres to have a successful hunt from flat terrain. His senses did not pick up anything new on the trail. 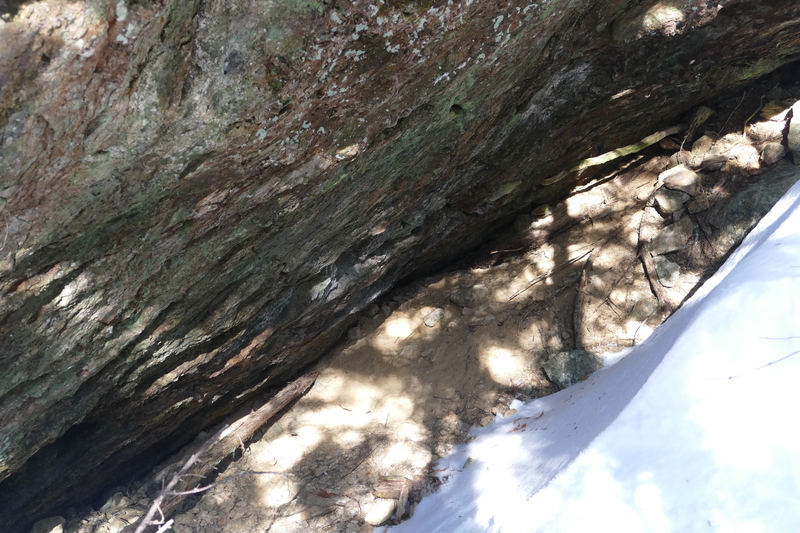 He walked slowly back to the cache site and climbed up the steep hillside west of the cache. 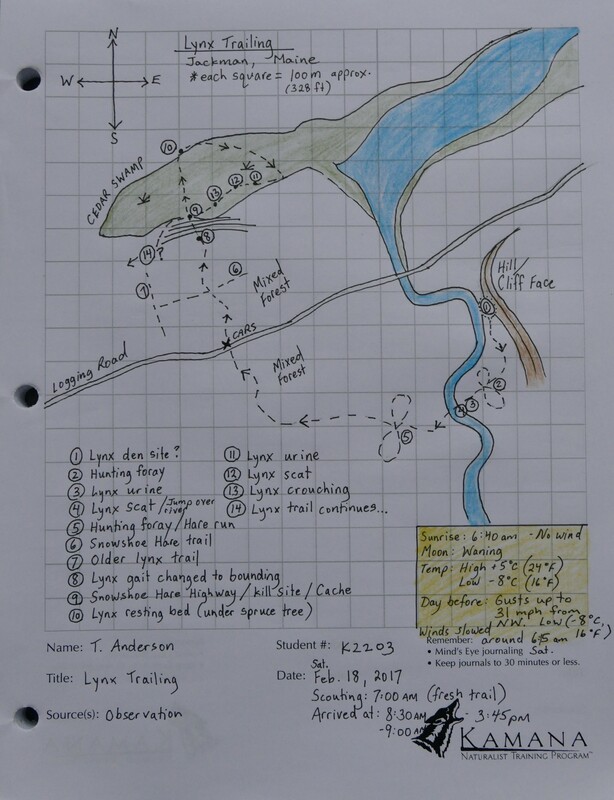 The well-camouflaged, grey-bodied lynx continued on his journey as a group of trackers began to descend on his trail, putting together the pieces of his story from that morning.